I already knew what it was going to say. Unfortunately. And I read it anyway because, apparently, I’m a glutton for punishment. And now, I must share it with you Internets. Because, that’s how I roll. It’s a writing prompt that I’m fairly 110% certain she will NEVER use again. Thank you Sweetboy. You have spared countless numbers of future second grade parents from having to gag while reading. You? Not so much. For that, I am sorry. Tomorrow is another day. Lord, have mercy. Yes indeedy. Oh, JUST THINK about what the teachers have heard. As a former 2nd grade teacher, myself, uh-huh!! I’m willing to bet that was the highlight of that teacher’s day. Especially if she noted that Sweetboy spelled all of his words correctly. See? 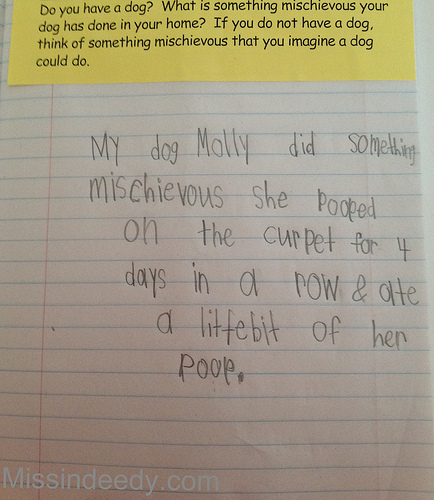 Even dog poop has a silver lining. Who knew? That is truth, right there! Thanks so much for stopping by. Hilarious! Laughed So hard I slapped the table!